But not all SPF is created equal. New studies show that many sunscreens contain ingredients that can be harmful to your skin and the environment. These include PABA and oxybenzones, which create free radicals in your skin and lead to long-term health problems. At the Beauty Bungalow we are big advocates of sunscreen, however, our favorites are mineral sunscreens which sit atop the surface of your skin, rather than being absorbed. 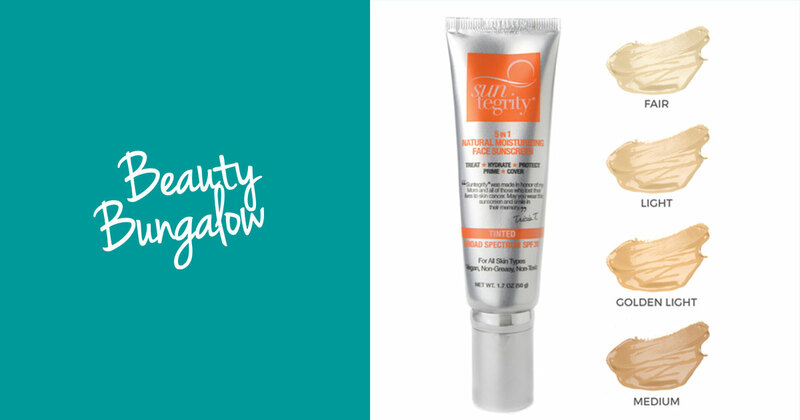 These work by blocking the sun’s harmful UVA and UVB rays… the sun rays literally bounce off and away with mineral SPF! A good rule of thumb: The higher the percentage of zinc oxide or titanium dioxide, the better. At the Bungalow, our go-to line is Suntegrity. This brand was founded by a daughter searching for a natural, mineral sunscreen line to help others after the loss of her own mother to skin cancer. The company’s high standards ensure that their product is free of harmful chemicals and safe for those with the most sensitive skin. In fact, Suntegrity was at the top of the Environmental Working Group’s Top Sunscreens for 2018. Come by today to get a complimentary color match for the bestselling 5-in-1 Moisturizing Tinted Sunscreen.